About 2 years ago, I was in a little bit of a Circle Time funk. If I had to sing the Itsy Bitsy Spider one more time, or twinkle my little stars for the trillionth time… I mean, I actually love both of those songs—but come on. I needed to freshen things up. As a parent, or a teacher, or anyone who spends lots of time with young kids, you might be in a similar situation. Lucky you—I’ve found your answer: Jbrary. Jbrary. is Dana Horrocks and Lindsey Krabbenhoft. They met while they were masters students of Library and Information Science at the University of British Columbia. And they are a children’s song and storytime powerhouse! Their website ( www.Jbrary.com ) and their YouTube playlists will have your toes tapping, your hands clapping, and your jumps jumping 🙂 . I’m warning you—the incredible variety of songs (about elevators and soup and bananas and everything else under the sun) will have your head spinning with ideas! Their enthusiasm is infectious (and was an important ingredient in the creative soup that inspired many of my teacher and librarian flannel board sets!). Bonus: they know their children’s books too. Over the years Lindsey and Dana have filled their website with a treasure trove of quality children’s books (a.k.a. Not Books With a Children’s Movie on the Cover). They are in tune (ha!) with the authors, artists and illustrators of the books they recommend, having spent years reading and evaluating meaningful stories for children. I’m so thrilled to have had a chance to interview them, and I know that whether you’re a parent, teacher or anyone else who has young kids in your life, that you’re going to love what they have to say! Wendy: I remember the first time I read a story to a group of children. Throw in having to sing and dance in front of them, and I was a bundle of nerves! You two are seasoned pros—can you suggest some ideas to make reading with kids (in a group and/or one on one) enjoyable for both the reader and the kids? And how about the singing and dancing part? Any tips?? Lindsey: My biggest tip for reading in front of a group is to practice beforehand. Get a feel for the rhythm of the language, find pages where you can ask the kids a question, and practice holding up the book and scanning it across the room. Preparing this way is essential to making the experience of doing it in front of a group more enjoyable, especially for yourself! You’ll feel more confident and be able to anticipate questions from the kids better. When it comes to books *and* songs I always recommend choosing things you love. Read books that have a character or storyline you enjoy; sing songs that you like to sing or you remember from childhood. When we do things we love our enjoyment shines through which is exactly the vibe you’re after in a storytime. It’s totally normal to be nervous. I channel my inner Elsa and try to let it go! Kids don’t care what your voice sounds like and they definitely don’t care if you make a fool of yourself (in fact, this will often elicit the most giggles). If you’re working with preschoolers or school-age children you can also follow their lead. What actions do they want to do? What noise does a rabbit make? Posing these questions to them makes them feel important and a part of storytime while at the same time lessening the stress on you. Storytime is one of those things that gets better with time and practice, so don’t be hard on yourself if it takes a while to find your own style. Dana: I wholeheartedly echo EVERYTHING Lindsey says above. It’s often helpful to see other people do storytimes, but always remember that your storytimes will be beautifully unique to you. While it can take caregivers and little ones a few weeks to get to know you, if you share yourself with them and genuinely enjoy doing it that will shine through. It sounds trite but when I take the time to laugh – truly laugh- during storytime, I know it is going well. This can come from me reading a word wrong, or a child giving a hilarious idea for the movement to try next, it doesn’t matter what makes you laugh but when you do you step out of the nerves of running-a-perfect-storytime and invite others into your joy. Try it! Wendy: Awesome advice—and I totally agree with every word. So, this next one may be impossible but here we go….When you think about some of your favorite books, what are a few common traits that stand out? And do you have some authors or illustrators that you think should be in every classroom and home of toddlers and preschoolers? Lindsey: Oh, this is slightly impossible! There is a difference to me between my favourite storytime books and my favourite picture books in general. For storytime, I look for books with large, bright illustrations that catch the reader’s eye and help to communicate the words to toddlers. A clear, consistent storyline is key and I love books that include a repeating phrase or sentence that I can have caregivers say aloud with me. I’m drawn to books that allow for participation from the audience either through movement or orally because that helps keep the wiggly ones engaged. Lastly, I try to find books that make caregivers laugh because then they’re more likely to check them out and read them again. I’ve shared many favourite storytime books lists on Jbrary with my annual picks, one of our most popular posts. I would also recommend any of my toddler storytime authors to know for a classroom library. For my personal favourites, I absolutely adore anything illustrated by Julie Morstad, Emily Winfield Martin, and Julie Flett, I view picture books as pieces of art so I’m always drawn to the ones that feel like I’m walking through an art museum. We know young children give about 90% of their attention to the illustrations when reading and I love books that convey a sense of beauty and wonder. Dana: It’s true, you have really asked the impossible here! The books I often reach for are heavy in the humour department – I’ve recently enjoyed It’s Shoe Time (Collier), The Wolf, the Duck, and the Mouse (Barnett) and A Good Day for a Hat (Fuller). But I have had some really quiet and tender moments when I have taken a chance and shared You Hold Me Up (Gray), Big Cat, Little Cat (Cooper) or a wordless wonder like Lines (Lee). It’s all about knowing your crowd and finding books to challenge and delight them. A book that Lindsey told me about – and which hugely helped me tune into picture books is Reading Picture Books With Children: How to Shake Up Storytime and Get Kids Talking about What They See (Lambert). I would highly recommend it to anyone who is involved with children and books. Wendy: Ooooh, I can’t wait to check out all of your recommendations! Now, I’ve worked with a lot of teachers who are fresh out of college, and they are often under the impression that story times are all about, as the name implies, reading stories. Why do you think it’s important to include music and movement activities in story time (and for that matter, into any child’s day)? Lindsey: From a practical standpoint, it’s important because otherwise you will lose their attention and it will turn to chaos! Children need a chance to move and stretch in order to be able to pay attention for short periods of time. When you look at brain development research music and movement also support communication skills. Through music, children experience regular beats, changes in tempo, accents, and synchronization – much like the rhythm of spoken language. As children learn to follow the beat of music, this can help them learn the rhythm of spoken word and help improve their communication skills. Singing slows language down and allows opportunities to focus on particular sounds of speech. Songs also serve as an excellent model of the construction of phrases and sentences. Lastly, music is an essential part of culture and provides an outlet to express feelings and emotions. So making storytime (and beyond) about more than reading is really a step towards fully supporting the early literacy development of the little ones. You mentioned communicating the importance of what you’re doing to the families and community partners. Along those lines, what would be your best few tips for parents and teachers of young children when it comes to early literacy? Can you suggest some easy things for them to incorporate into their busy days? Lindsey: One of my best tips to support early literacy is to talk throughout the day and narrate what you are doing. This can be as simple as saying things like, “Are you feeling hungry? Let’s have a snack. I’m going to get a plate and cut you up an apple.” You literally say what you are doing. Research has shown that exposing a child to a varied and large vocabulary supports their learning for years down the road. Even more importantly though is the back and forth conversations that talking throughout the day supports. When we ask children questions and wait for their reply or even pretend that a baby’s babbles are real speech we are encouraging their neural networks to make lots of connections that support brain development. Another tip is to find a few key songs or rhymes that you can incorporate into daily routines. For example, maybe every time you eat dinner you sing Knife, Fork, Spoon, Spatula. Or every time you change a diaper you sing Charlie Chaplin Went to France. Attaching songs to routines makes it easier to remember to sing during the busy day and also provides a cue to the child as to what to expect. As always, the more fun and joy you can infuse into these activities the better. And I’d be remiss if I didn’t mention visiting the library to attend our storytimes and get a fresh set of books to take home to support these activities. Dana: The one message which I like to lead with is: follow your instincts. I find that when I talk about early literacy practices with caregivers quite often they are already doing many of them and our role is to celebrate that and provide new ideas. I like to emphasize the things parents are doing like the special voice they use when they talk to their infant (called “parentese” in research) which helps baby cue into their voices when they speak. Using this example helps build confidence and remind them that they are their child’s first and most important teacher. Then you sneak in a new burping song and they are empowered! 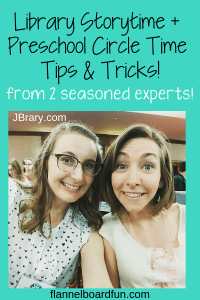 Finally, because Lindsey failed to mention it – she led the charge on a blog round-up called Early Literacy Messages in Action and it’s a gold mine for learning about incorporating early literacy tips from some of the best #kidlib brains on the web. I can’t thank Lindsey and Dana enough—not only for taking the time to answer all of my questions so thoughtfully and thoroughly, but also for all of the work they do and resources they provide for the children and families in their community, and the internet community too! Please take some time to check out their website and Youtube channel—it will be time so well spent! Very interested to know how you share wordless books during story time. I’d love to take a stab at sharing Bill Thomson’s CHALK. Hi Jennifer. I personally haven’t used many wordless books during story times, because they tend to be such conversation starters that I’ve found they work best with small groups or one-on-one. But Lindsey and Dana might have some great tips on this–I’d highly recommend checking out their blog at JBrary.com–and sending them a message if you don’t find anything. Good luck!